Clutter is the unnecessary extra stuff, the things that don’t have a place to go, and the stuff that doesn’t fit in our home. Peace and joy abound at Christmas time, but so does clutter. 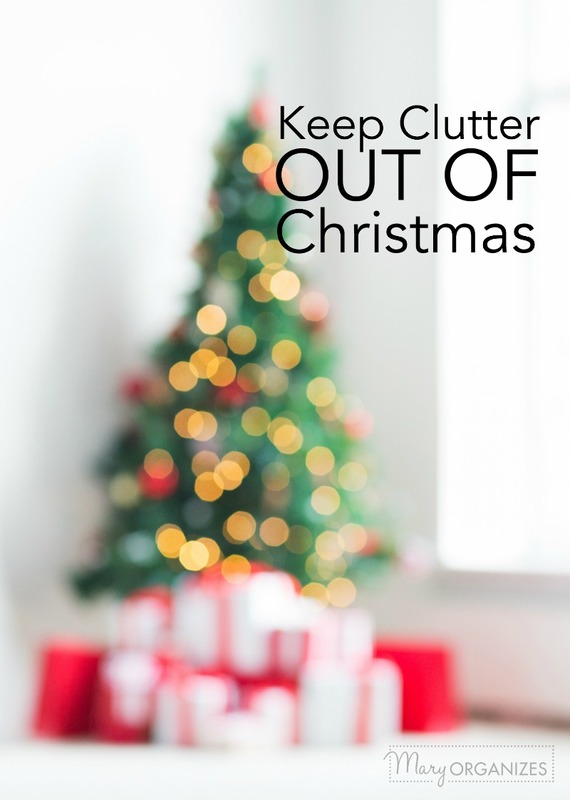 Clutter can suffocate our Christmas spirit, but we can stop it! While you decorate, or even after you decorate, remove the things that you don’t like anymore and leave the guilt behind! You get to keep all of your memories, even if you don’t keep the stuff. Now is the best time to donate Christmas decorations while they could be most useful to someone else. By all means, use Pinterest for inspiration, but stop competing with strangers on the Internet! Unless going all out with Holiday Decorations fills you with joy, keep your decorating simple. Simple is easier to put up and easier to take down. Amazing memories are made in simply decorated settings. The sentimental and important things can get lost surrounded by just too much stuff. A beautiful tree, stockings, a nativity, and a wreath are my essential decorations – in my opinion, anything else is gravy. A common complaint I hear from clients and readers is that their kids’ toys are a mess. If kid toys are impossible to keep tidy, then they have way too much stuff. Adding more toys will only make the problem worse. Teach your children about giving while making room for their Christmas gifts, a win-win. Have your children pick toys in excellent condition to give to another family who may enjoy the gifts or give to a local children’s charity. Gift-giving can sometimes be a little tricky, but thinking through gifts to get our loved ones is good for us. Focusing on other people brings more Christmas magic to the season. Thoughtful gifts are a lot less likely to end up as clutter, because they will be used and valued. Take the time to really ponder your gift-giving list! Also acknowledge that you may not have been correct about what someone really wanted or needed, and gracefully allow them to return or exchange a gift from you without any guilt-trips. There is a lot of advice out there to give experiences instead of stuff. I love this new trend, but I also acknowledge my children love to open gifts and not just envelopes. Experience-Themed Gifts balance “stuff” with “experience”. Some experience gifts support a new hobby. The year my girls were really starting to get into sewing, I got them themed gifts around this new hobby (thread, fabric, tools, etc.). This year they’ve begged for art lessons, so they will be getting art lessons and the materials and tools they’ll need. That is why I call these kinds of gifts Experience-Themed, because they center around an experience but there are still fun gifts for kids to open. Experience-Themed Gifts have consumables as part of the gift, things that will get used up, which makes the clutter of the gifts more temporary. The best part of Experience-Themed Gifts for kids is that it extends the magic past the day they open the present and they make some of the best memories. When it comes right down to keeping clutter out of Christmas, it really is a state of mind. Think of the simple beauty of a beautiful field covered in snow. More stuff does not make this season more meaningful. The magic and the meaning of Christmas is in our hearts and how we treat others. Keep it simple and it will be extraordinary! Well my original comment was love, love, love. Great ideas. Thanks so much Mary. Merry Christmas! That was a great article! Thanks Mary! Yeah, I think I will purge a lot of those gilt gifts that I have received over the years. I have Christmas themed spreaders, bowls, plates and cups for Santa, and what nots that just sit around. It is always a pain to try and find somewhere to put them on display and away for the rest of the year. Goodwil, here we come! Yes, they will be someone else’s treasure! Thank you Mary. You are so wise . Thank you for sharing with us. That’s so nice of you Mary. Thanks for sharing.